﻿ Irish Film Institute -CELEBRATING INHERENT VICE WIN A T-SHIRT & NECKLACE! 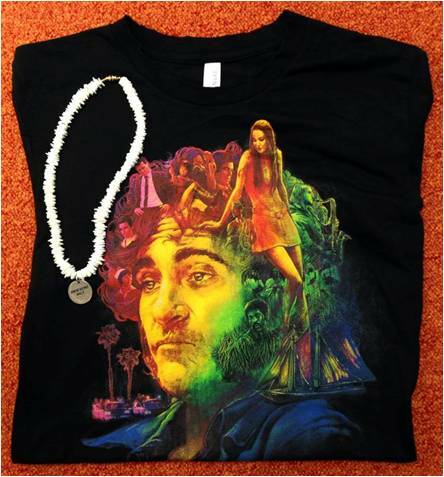 CELEBRATING INHERENT VICE WIN A T-SHIRT & NECKLACE! Celebrating Inherent Vice the new film from Paul Thomas Anderson, which opens today, Friday January 30th at the IFI, we have five Inherent Vice t-shirts and necklaces courtesy of our friends at Warner Bros. Pictures to give away to five lucky winners! 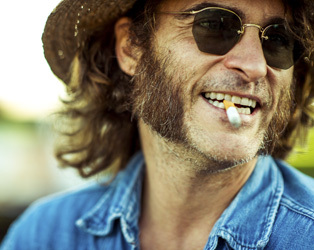 Given the sprawling and complex style of Thomas Pynchon’s novels, with their numerous digressions and huge casts of characters, it may not be particularly surprising that Inherent Vice is the first film adaptation of his writing, but it’s surely less surprising that the task has been entrusted to Paul Thomas Anderson, whose own work could be similarly described. This film may prove to be the best point of entry to either man’s oeuvre, an immensely entertaining, very funny, shaggy dog noir in which Joaquin Phoenix’s Doc, a perpetually stoned private investigator in 1970 Los Angeles, becomes embroiled in a labyrinthine plot when his ex-girlfriend (Katherine Waterston) comes to him for help. Subsequent story threads and scene stealing turns (including a prescient Joanna Newsom and a truculent Josh Brolin) meander in and out of focus in this magnificently tumbledown triumph. True or False? Inherent Vice is based on the novel by Thomas Pynchon. Check out the Facebook & Official Inherent Vice film page! © 2015 Warner Bros. Ent. All Right Reserved.